Are you finding it harder to get volunteers these days? Why not use Facebook? That’s what one Wild Apricot customer, Patty Foley, the Membership Chairperson of Newington Community Television, did to find her latest volunteer. She posted her request for new volunteers on her organization’s Facebook Page, Newington Community Television, which has about 300 members, and in her community’s private Facebook Group, What's Happening In Newington, which has about 4,700 members. The next day, she had a message from someone willing to sign up. They exchanged a few private messages on Facebook, then spoke on the phone, and finally Patty met her new volunteer for lunch to go over the job description. If you want to follow Patty’s success and use Facebook to recruit volunteers, here are five simple tactics you could use. You can simply do what Patty did and post on your community’s Facebook Page or in a Private Group. It will only take you a few minutes to do. And you might just get a quick response, like Patty. Don’t just ask for volunteers when you need them. Every time a volunteer helps out, post a picture of them on Facebook and write a little story about who they are and what they did, with a link to your volunteer recruitment form. When you use stories like this that showcase how much fun it is to volunteer for your organization, and the big impact a volunteer can have, you’ll inspire other potential volunteers to follow suit. Make sure you tag your volunteers in your photos and ask them to share the photo to get more exposure. You can also ask your volunteers to post their own pictures and stories to their Facebook pages, with links to your volunteer form. It’s well known that word of mouth is the best form of advertising, so what better way to help spread the word than by getting your volunteers to do it themselves? I personally have about 400 friends, so when I was looking for volunteers to help cook breakfast at my local YWCA shelter, I posted my request in my Facebook Status. After a day, I had two dozen likes, a few comments, and one person willing to help out. But here’s the kicker. I also asked ten of my friends to ask for volunteers in their statuses too, which multiplied the amount of people that saw my message by ten. And after a day, when I checked their statuses I had over 100 likes, a dozen comments and twelve people willing to help out. With very little effort, I was able to more than fill my need for volunteers in a very short period of time. What are you doing Sunday afternoon? Would you like to give back to your community? Even just a few people posting your message can triple the amount of people it reaches. Did you know that you can use Facebook to send a volunteer recruitment message to people already interested in volunteering in your community? You can do this with Facebook Ads. On your organization’s Facebook Page, go to Facebook’s Ad Manager and create your ad. Then create a new audience to send your ad to. First, name your audience, then select the city or location that you want volunteers in. Next, select people who may be interested in volunteering by typing “volunteering” (and related terms) into “Interests”. Once you do this and begin to run your ad, it will only show to people in your area who are interested in volunteering. This is an easy (and inexpensive) way to get new volunteers for your organization. Instead of creating a new audience, you can use the email addresses of your organization's members as an audience to send your ad to. This is a great way to ensure that as many of your members as possible will see your request for volunteers, especially if you haven’t been getting a lot of volunteers from sending emails to your members. Export the email addresses of your contact database into an Excel document. Create an ad in Facebook asking for volunteers using Facebook’s Ad Manager, then upload your email list. Facebook will match all your emails to their respective accounts, and voila! Your volunteer ad will be shown to all your members on Facebook. If you need some help creating your own Facebook Ad, our very own Shiv Narayanan tells you everything you need to know in this free on demand webinar: How to Increase Members with Facebook Ads. 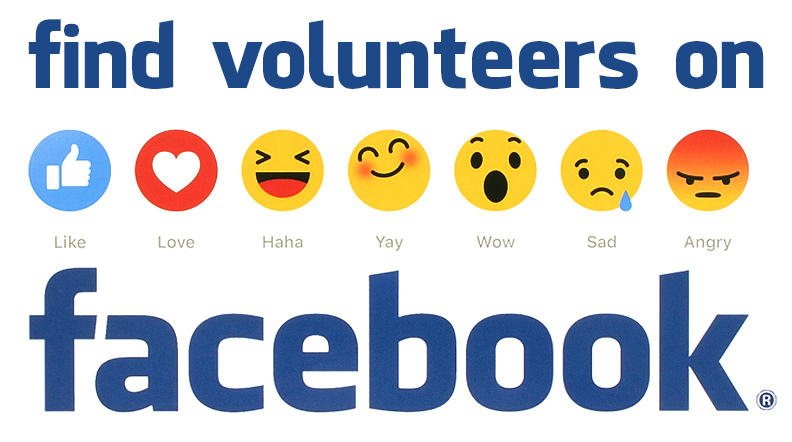 Best of luck with finding volunteers on Facebook!